Various international industrial and research projects have developed interfaces between aiT and other analysis tools. 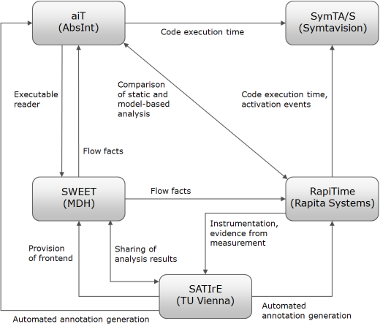 For example, in the ALL-TIMES project, aiT was integrated with several other timing-analysis tools into a single development framework. “Airbus Operations S.A.S has estimated that its use of the INTERESTED tool chain resulted in a 48% reduction in overall project effort […]. Thales reported that the rigour imposed by the use of model-driven tools compared to freeform alternatives resulted in a 25% reduction in overall project effort […]. Siemens Mobility reduced overall projects costs by 20% […]. Focusing on overall development effort, the Commissariat à l’Energie Atomique et aux Energies Alternatives estimated that […] initial development costs were reduced by approximately 40% and 69% for on-going maintenance costs.